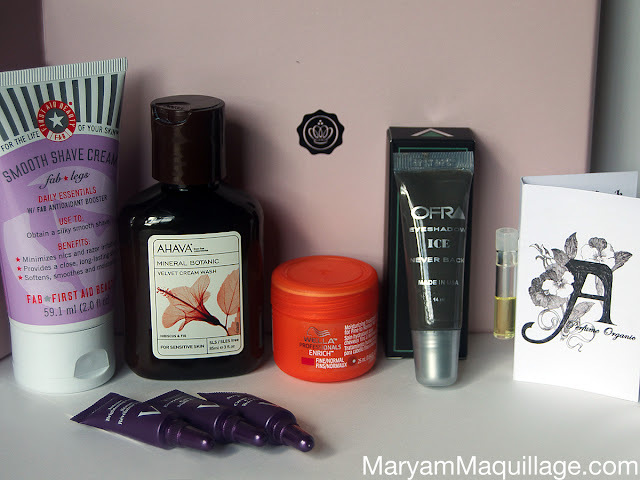 Maryam Maquillage: June Glossybox Review! Bonjour mes amis! June's Glossybox* has finally arrived -- no thanks to my mailman who failed to leave me a notice when I missed it nearly a week and a half ago -- so my review is a bit tardy, but better late than never! I've been in love with Ahava products ever since my very first trip to Israel, a few years ago. It is my number one requested gift from Israeli friends when they come visit me in New York. I live for anything Ahava, so needless to say, I was ecstatic to find this body wash sample in June's Glossybox. Formulated with Dead Sea minerals and natural moisturizers, this rich body wash is hydrating and refreshing -- the scent alone will awaken and uplift your spirits in an instant. This luxurious, moisture-boosting wash is perfect for the summer and is my favorite product in this month's box. I'll definitely be putting in my request for this glossy item! Having tested this gentle shaving cream just once, I can confidently say that it delivers a closer and longer-lasting shave than its drug store competitors. My leg hairs tend to grow rather quickly (sorry for the TMI) and I usually have to shave them every other day (sad, but true)... With this product, however, I get an extra day of smooth, silky legs and I'm all 'bout it! The product glides like a cream, but doesn't work up a big lather, which is probably the reason why it's so non-irritating and easy on the skin. Another fave! As most Wella Professionals products, this hair treatment is wonderful. The silk extracts in this product instantly restore moisture, boosting elasticity and adding shine to hair that needs a little TLC. My only criticism with this item is that it is a tad too small to really enjoy. The reason I love Glossybox is because every month, it introduces me to a brand I would've otherwise never heard of. This "Dead Sea mud" colored eyeshadow would make a great primer, but the color is a tad... well, muddy... so I'm not sure that this product will make it to my instant favorites list. I'm definitely gonna give it a good ol' college try, but so far, the shade I received doesn't inspire summer activities. This was the collection sample I was most excited about, but I'm sad to say that I barely got a chance to test out the contents. The tubes are misleading, containing much less product than they can actually hold, so it almost doesn't make any sense to give these out as samples. I can't say that I like or dislike the creams because trying a skin care product once doesn't exactly sell it. Most creams have to be tested for at least a week, and these tubes barely hold enough product for a single use. Bonus: Urban Organic fragrance sample A Perfume Organic -- a lovely combo of lavender and grapefruit make for a fresh, citric scent reminiscent of fragrant oils and aroma therapy. 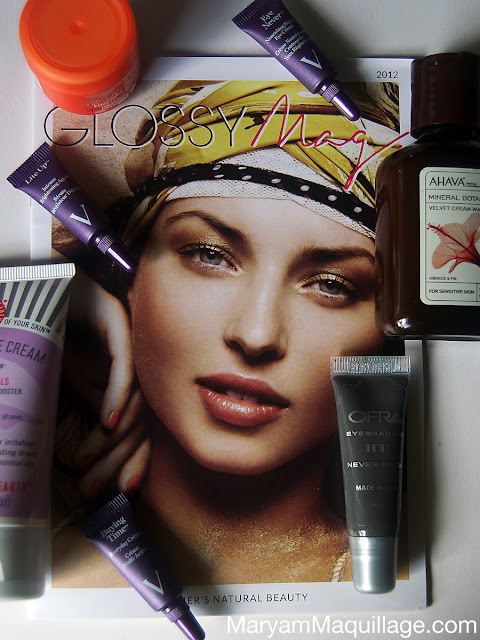 Also Included: Glossymag mini-magazine complete with tips, tricks and makeup ideas for the summer. VERDICT: June's Glossybox leaves me yearning for more. Although I love most of the products, some of the samples are a little too small to appreciate. I would've liked to have seen a deluxe sample of a high-end sunscreen, self-tanner or facial bronzer, but I'm content with the fragrant body wash and nourishing shave cream. Overall, I like the products, but I'm not as excited as I was in the previous months. With that said, I still think Glossybox is the most luxurious beauty sampling subscription service of its kind. What are your thoughts on the contents of June's Glossybox? *The product/s in this post were sent for my consideration and review. Tá rolando sorteio lá no meu Blog, para noivas, chá de bebê e de panela e quem quiser participar!! Corre lá! I'm so excited! I just made a subscription to Glossy Box-- fantastic review!! Looks like great products. I've been on the fence about this box! Thanks for the informative review! very informative review! everything looks so nice!